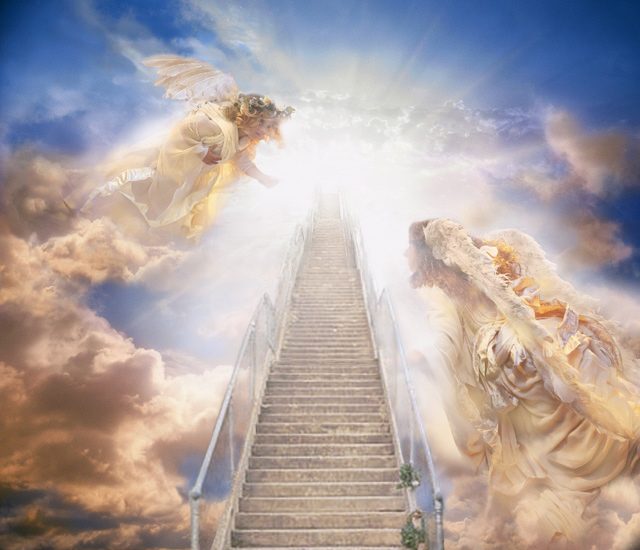 “Do you want to go to heaven?” Anyone who believes in God would almost certainly answer that question with a “yes!” No one who believes would desire anything else. So why, then, do we have to worry about going to heaven? Some people mistakenly hold that, “since God is all-loving, what loving God would want us to burn in hell for our sins rather than be with him in his kingdom? He wouldn’t deliberately condemn any of his children; therefore, everyone will go to heaven!” Unfortunately, that’s not a correct read on God, as they leave out one very important element: free will. Yes it is true: God desires the salvation of everyone. His death and resurrection made that possible for all of us. But in order to enter heaven, we must follow him. That is up to us. Imagine if you will a ship that has come to rescue people who were tossed overboard in a shipwreck. The ship anchors and sends a ladder down into the water for everyone to climb up to safety. Many people do, but others, for whatever their reason, refuse to climb the ladder. Maybe they are enjoying the water and see no reason to get on the ship, or maybe they’re expecting the captain to jump into the water and drag them out personally. They argue, “The captain doesn’t want us to drown, so he’ll jump in and pull each of us out of the water.” And so they stay treading water waiting for the captain to save them. The ladder is still there and the captain is saying, “Come on! Grab onto the ladder and climb up onto the ship!” but the person says, “No, I don’t have to because I know you’ll come down and get me!” Well, what happens? Glug! Glug! Glug! The person drowns. Did the captain deliberately drown the person because he refused to climb the ladder? No, he is very upset by the fact that the person drowned, but it was the person’s own fault. So those who were saved were saved because the captain threw down a ladder to make their rescue possible. As for those who weren’t saved, it was their own fault! It is the same way with God. By becoming man and suffering, dying, and rising for us, he made our salvation possible. But you and I have to freely avail ourselves of what he offered in order to enter heaven. Remember that, while we often think of heaven as this big banquet going on in heaven, theologically speaking, “to go to heaven” means to be perfected, to be perfectly formed in the image and likeness of Christ, to be totally present to him. What needs to be perfected? Our muscles? No. Our hairdo? No. Obviously, it is our will. Original Sin occurred when Adam and Eve said no to God and yes to sin. Our salvation is when we reverse that, when we say no to sin and give our full assent to God’s will. Now, if God were to force us to follow him, that would not be our free will, our own consent; it would be coercion. So God cannot drag us by the hair into heaven whether we want to enter or not – he can’t force us to be perfected. He will help us, but it has to be our own choice. Hence, anyone who is saved is saved by the grace of God; anyone who is not, it is his own fault! God saves those who are saved; the condemned man, by his own refusal to follow God, condemns himself! So therefore, no one can sit back and rest on his laurels thinking his salvation is in the bag. We must work on it every day by following God’s law. Yes, he desires our salvation and he helps us in a thousand ways every day to walk the path, to climb the ladder out of the waters of death, but we have to walk, we have to climb. He cannot do it for us.